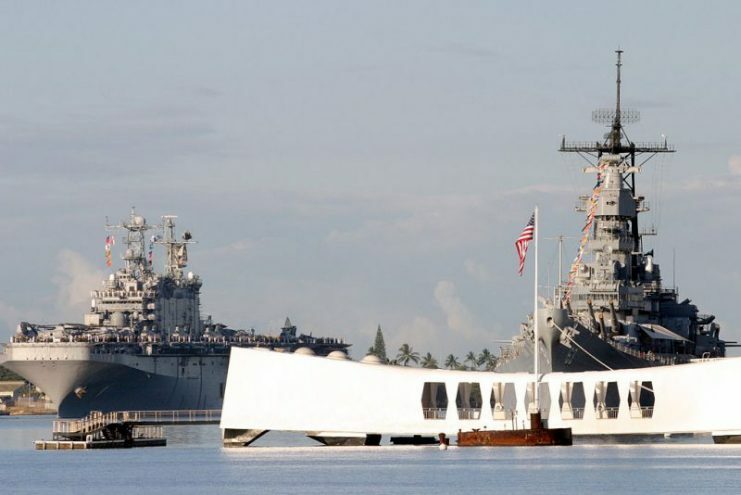 One of the most traumatic losses the United States experienced during World War II happened before the country had even gone to war – the Japanese attack on Pearl Harbor that took out the battleship USS Arizona on December 7, 1941. Arizona was the second of the two Pennsylvania-class “super-dreadnought” battleships. Although built in 1916, she didn’t serve in World War I, and never had a chance to serve in WWII. A massive explosion onboard during the surprise Japanese attack destroyed her beyond repair and sank her at her berth. 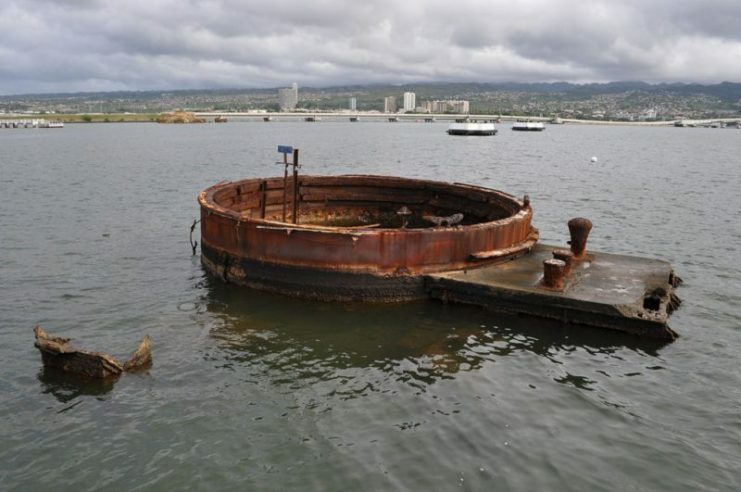 Arizona has lain undisturbed on the bottom of the harbor since that fateful day, symbolizing more than the losses the U.S. endured during World War II. It is a testament to a nation that, in a matter of days, was catapulted from peace into war. 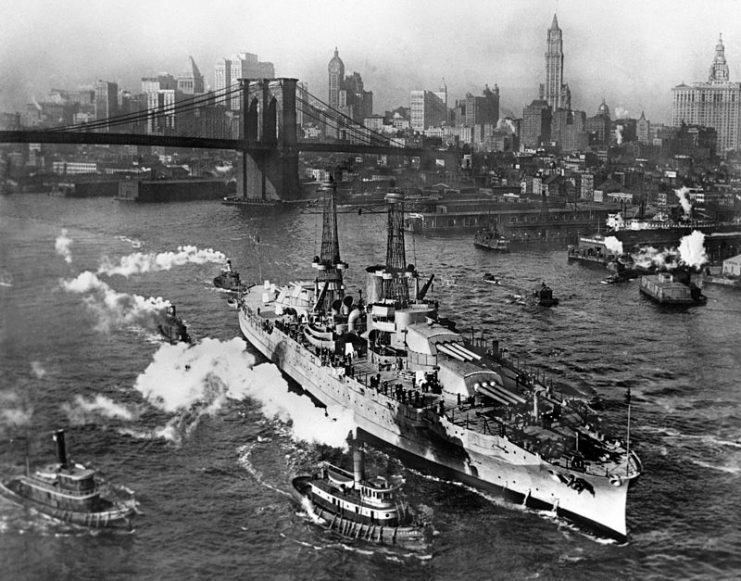 View of USS ARIZONA taken from Manhattan Bridge on the East River in New York City on its way back from sea trials. December, 1916. In 1941, the U.S. had still not officially joined the Allies in the battles raging across Europe. The public was tired of conflict. World War I (1914-1918) had cost thousands of American lives. By 1940, most civilians wanted no part in another war. Politicians routinely tested the waters in relation to the public’s attitude toward the conflict, and the polls were clear: stay out of it. But everything changed in December 1941. Ever since the War of 1812, the nation had not experienced a large scale attack by a foreign power on its own soil. Furthermore, Japan did not declare war against the country, or even express open hostility, before more than 400 of their planes descended on Pearl Harbor. One of their early victims was Arizona. Her death toll represents nearly half the lives lost that day. 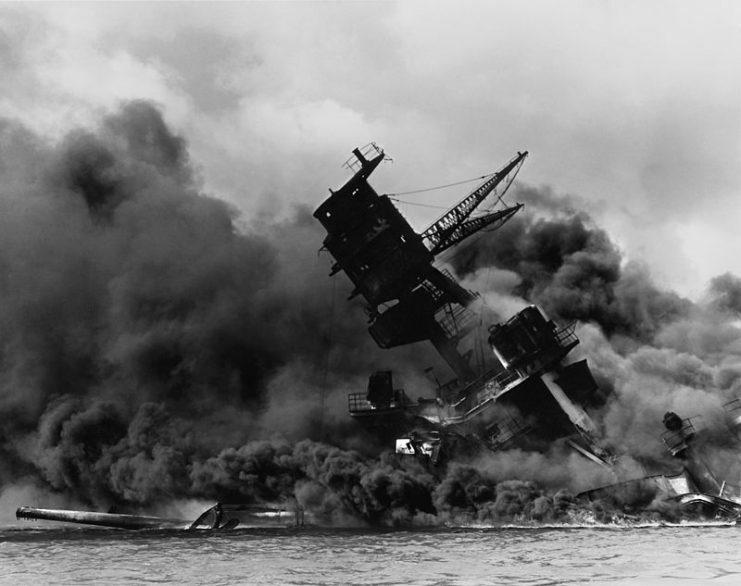 Although the U.S. had not wanted to get involved in WWII initially, public sentiment changed virtually overnight after the attack on Pearl Harbor. The next day, the U.S. joined forces with the Allies already fighting in Europe. 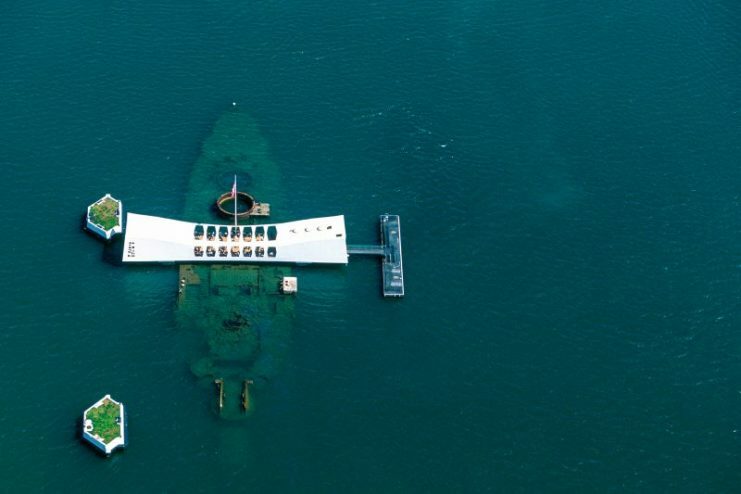 Today, tourists in Hawaii can journey to the USS Arizona Memorial by boat. It is a solemn journey that allows visitors to pay their respects to the deceased crew members and view the ship’s hull beneath the memorial. 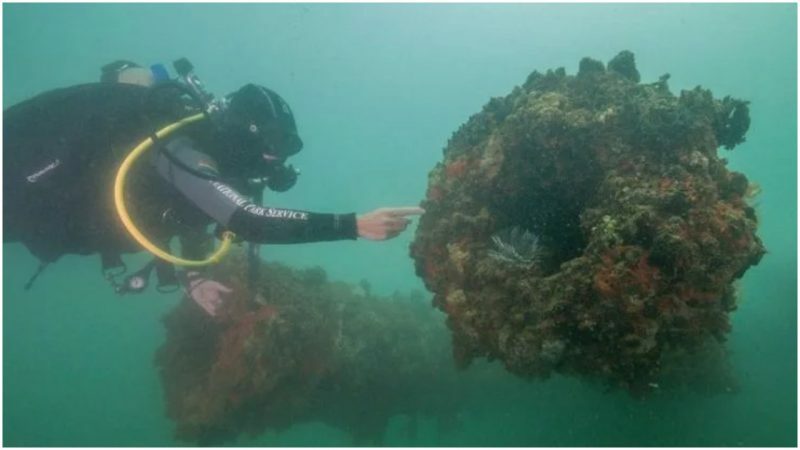 The Arizona is the most examined shipwreck in the world. Thanks to modern underwater exploration technology, it may soon be the most understood one as well. 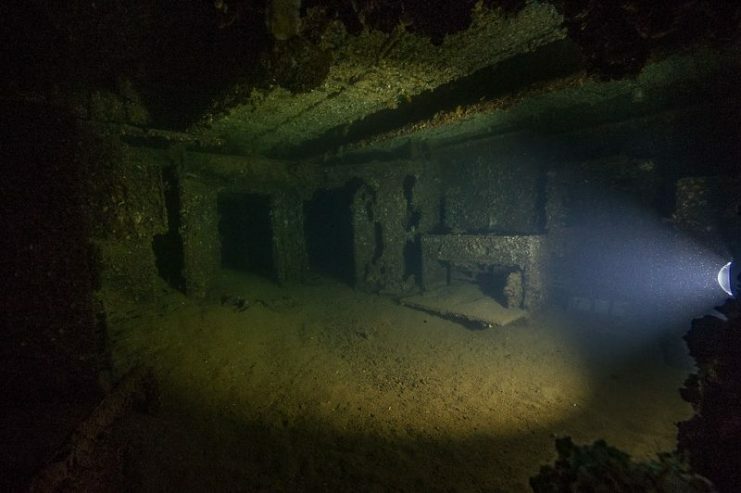 The National Park Service manages the memorial site, and recently its Submerged Resources Center (SRC) was able to retrieve images from several decks of the ship. Brett Seymour was in charge of the operation, which was made possible by advances in technology. The crew was able to examine many of the ship’s contents without disturbing them. 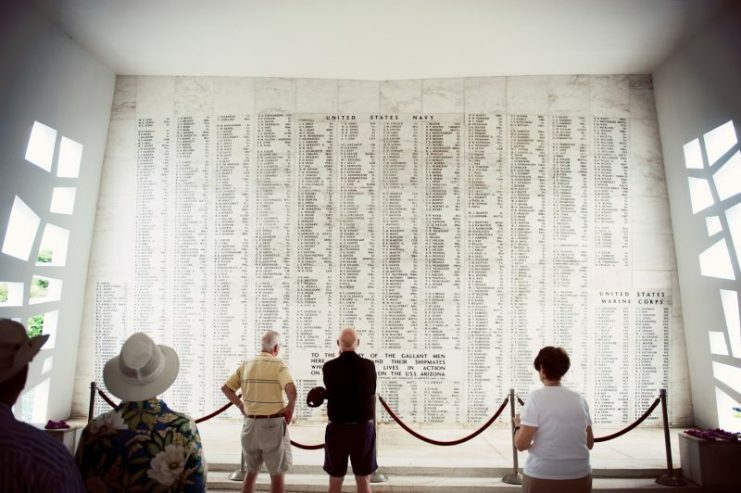 Onlookers look at the Memorial Wall on the remains of the USS Arizona. Seymour and his team, along with photographers from National Geographic, spent ten days exploring the interior of the first and second decks. As technology further improves, it is hoped that they will be able to examine the fourth deck as well. Shipwrecks are affected by how much oxygen is in the water. As the SRC’s instruments went deeper, the oxygen decreased, meaning that the better preserved objects were at the lowest levels. The men used a remotely-operated vehicle (ROV) designed by Imaging Technologies and the Woods Hole Oceanographic Institute. For Seymour, the most heart-wrenching discovery was that of a jacket in pristine condition with no discoloration or degradation of the fabric. It was discovered hanging in an officer’s quarters, completely clean, as though the officer were about to retrieve and don it at any minute. It was an emotional moment for all involved. Since 1982, surviving crewmembers of the Arizona can elect to be interred in the hull of the battleship upon their death, so that they can forever rejoin their fallen comrades. Visiting this spot in person is extremely emotional. Nobody leaves this place without becoming teary-eyed. 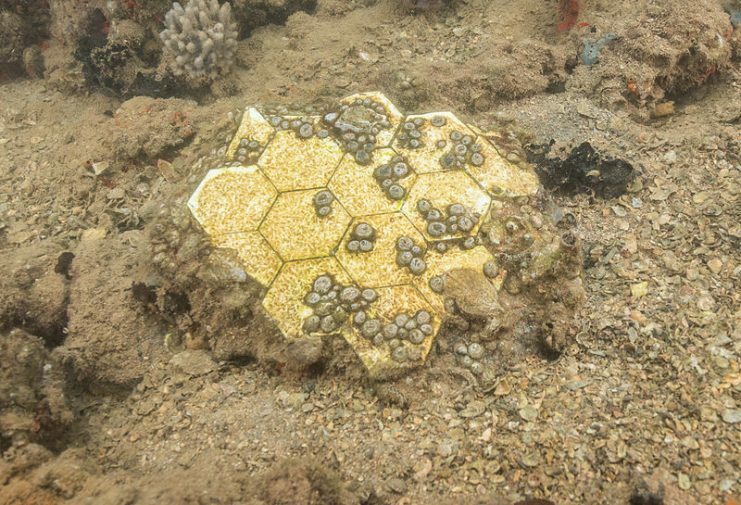 The ROV captured more than just images of the ship’s contents. It also gathered soil samples and other scientific data, which Harvard University is currently studying. Seymour has said that of all the dives he’s done in his 20-plus years career, Arizona was the most disturbing and emotional. His greatest concern now is determining how the ship can be explored and examined further while kept intact for future generations. Those are the questions that preoccupy him today.